We are huge fans of juicing! It is one of the most important aspects of looking and feeling good for us. We don't have anything against using NutriBullets or Vitamix, that will be a future blog. Ideally you should do both each day! We can say from experience that we get more benefits from the juicing then from the blender. Juicing is "instant gratification" to you digestive system. Your body doesn't have to work to break down the food and absorb the nutrients. Instead, all those power packed vitamins are readily available to go straight to your cells to detoxify and restore your body. But what about fiber? Isn't it better to blend your veggies so you get the fiber also? Fiber has it's time and place in your diet, but once you feel how much energy you get and how great your skin looks from juicing you will probably agree that juicing should also be a part of your daily routine. Since the micronutrients of the juice do go straight into your bloodstream there are a couple rules we follow to make sure we don't feel the side effects of a rapid blood sugar spike. Make sure you are mostly juicing greens. Our favorite juicing recipe is below. Feel free to change it up, but always keep a similar ratio of veggies to fruits. Remember beets and carrots are more sugary vegetables so limit how much you add to your juice. Juice on an empty stomach. Many people juice first thing in the morning. Personally we can't trade off our warm cup of coffee for a juice when we wake up so we usually juice after our morning workout. This way our cells are extra receptive to the sugar. To counter the blood sugar spike, eat protein or fat 15 to 30 minutes after juicing. Good choices would be an egg, a spoonful of nut butter, a few slices of turkey bacon, a grass fed beef patty, etc. Drink your juice within 15 minutes of preparing it. When the juice is exposed to light and air it will destroy the nutrients. 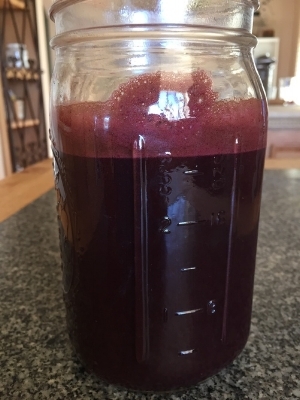 Research says you can store your juice in a dark, airtight container in the refrigerator, but juice goes so fast in our house that we've never had leftovers to test this with! Try to sneak in some garlic and ginger. These are great for their "anti" effects (anti-viral, anti-septic, anti-histamine, anti-inflammatory). Don't buy your juice in a bottle. If it's on a store shelf it's been pasteurized, which means it's been heated to kill all the bad bacteria as well as the good nutrients. 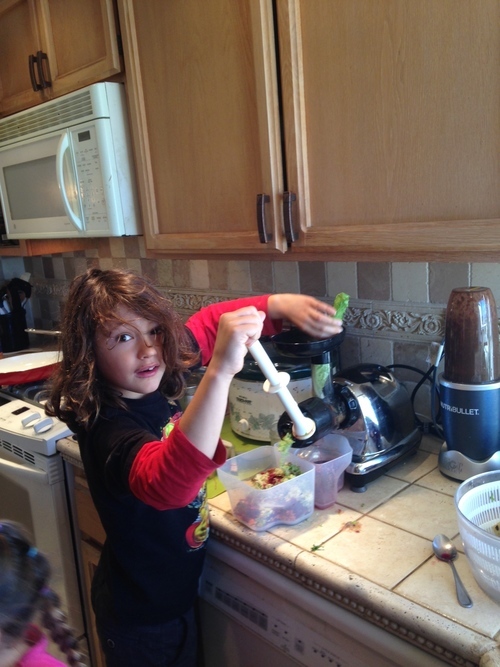 Our kids love to juice! Of course they weren't huge fans at first. It took them drinking some sweeter versions at first before we could start sneaking in greens. The younger ones like carrot, apple, lemon juice. Yes this is a more sugary version of a greens juice, but it is packed with so many nutrients it's worth the small blood sugar spike. Like we tell our kids... No Whining! Please don't tell us your excuses why you can't juice. It's too expensive...get more creative in your budgeting, eat out less often, buy less clothing, drive an older car. It takes too long to make...Really?! I've timed it, 10 minutes to rinse veggies, make juice, and clean juicer. Everyone can spare 10 minutes towards feeling amazing! But it's so much to wash. We have the Omega (which we love) and it takes 1 minute to wash. ONE MINUTE! What about the wasted pulp? There are many things that get wasted each day, we think we can let this one go since it is contributing to so much good in our bodies. But if it really bothers you then compost it or make it into veggie patties. Take the challenge...Try juicing everyday for a week and see how great you feel!